Built with both style and function in mind, TOTO’s Supreme II Washlet+ S300e toilet and bidet system is sure to take your bathroom experience from ordinary to extraordinary. The Supreme II toilet itself is a one-piece, ADA compliant (universal height) unit and comes with TOTO’s signature Tornado Flush technology and CeFiONtect bowl glaze, both of which work together to deter residue from sticking. TOTO specially designed it to hide the cords and hoses of the S300e Washlet+ bidet seat for an extra-sleek look. 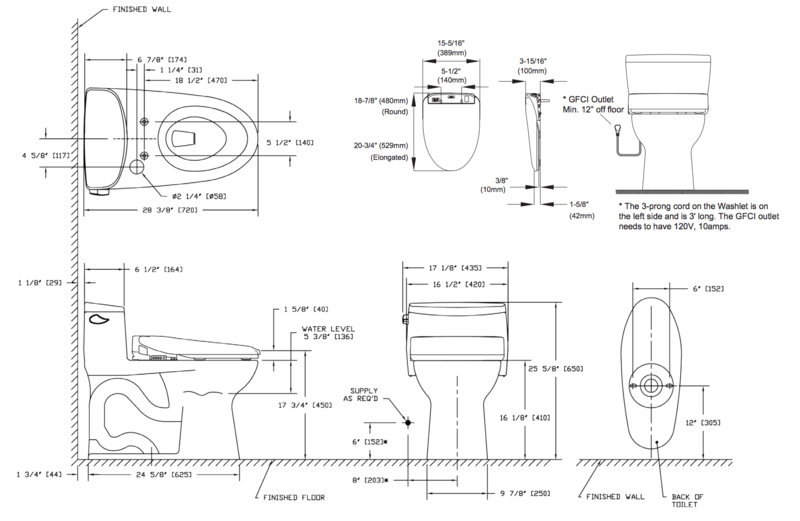 Do note that because of this special design, the S300e Washlet that is included in the purchase of this system isn’t compatible with non-Washlet+ toilets. The S300e Washlet+ is packed with high-end features that deliver all the comforts and conveniences you could want. As someone sits down to use the restroom, the S300e automatically coats the toilet’s bowl with a thin layer of sterile water to help prevent any waste residue from sticking. Four wash modes (front, wide front, rear and soft rear) offer a solution for every bathroom situation, and the unit’s water pressure, wand position, water temperature and seat temperature are all adjustable for maximum user comfort. What’s more, the S300e’s instant water heater provides unlimited warm water, so you don’t need to worry about running out no matter how long you run the wash cycle. Oscillating and pulsating spray options provide additional soothing for tender areas and can even help stimulate the bowels, and the wash stream is infused with tiny bubbles for a gentle, yet effective, cleanse. The S300e’s warm air dryer has adjustable temperature settings and can serve as a stand-in for abrasive toilet paper, if you so desire, and the built-in deodorizer automatically chases away bathroom odors each time the unit is used. Furthermore, after each use, the S300e uses sterile, electrolyzed water (eWater+) to sanitize the nozzles. As an added convenience, the S300e gives users the option of programming their favorite settings into the wireless remote as an alternative to selecting them manually each time. The Supreme II Washlet+ S300e toilet and bidet system features a great look and delivers a truly fantastic wash and dry experience, making it an excellent choice for anyone looking to revolutionize their bathroom routine.